A girl wakes up on the train tracks, a subway car barreling down on her. With only moments to react, she hunches down and the train speeds over her. She doesn t remember her name, where she is, or how she got there. She has a tattoo on the inside of her right wrist of a blackbird inside a box, letters and numbers printed just below: FNV02198. There is only one thing she knows for sure: people are trying to kill her. The Maze Runner series meets "Code Name Verity," "Blackbird "is relentless and action-packed, filled with surprising twists. 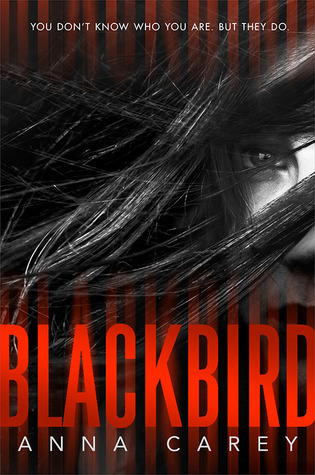 Told in second person POV, Blackbird is a book that puts you, the reader, directly in the action of the story. At first this was incredibly disconcerting because second person is not that common in literature, and for good reason: it's really hard to do it well. But after a while, you begin to settle into it more. While I never completely bought into the second person POV, I do think it helped give the story a sense of immediacy that first or third person couldn't have done. While the publisher description above calls this book The Maze Runner meets Code Name Verity, I think a more accurate comparison would be the YA version of The Bourne Identity -- especially given the action-suspense nature of the story coupled with the main character's amnesia. I enjoyed this story for the most part and am possibly interested in reading the sequel, but I didn't care for the lack of any sort of resolution at the end. Cliffhangers are one thing, but just deciding to wait until the next book to attempt any sort of resolution just didn't sit well with me. I know this is becoming a more frequent trend in YA lit these days, but it's not one I'm a particular fan of. Overall, Blackbird was an exciting, action-packed read though I'm not sure I was emotionally invested enough to read the sequel.